A work-smart kitchen layout was a must for this homeowner. That’s why she got together with the Renovisions team. In the old kitchen, lack of enough cabinet space and organized storage, created an overflowing situation with contents pushed to the countertops, making it hard to escape the clutter. Moreover, the inconvenient position of the refrigerator made entering and exiting the kitchen literally a squeeze. Redesigning the kitchen was a challenge but Ed envisioned a new spacious layout that naturally flowed between all work areas. 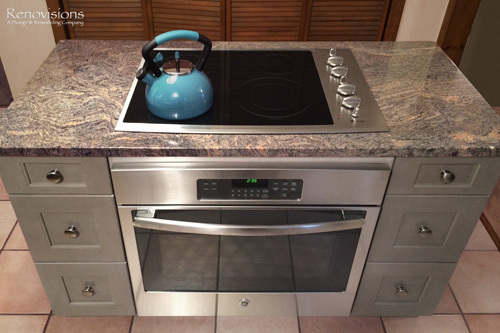 At the top of the must-have list was the addition of an Island with an electric cooktop and much needed deep drawer storage. To create a better flow, the work surfaces, storage and appliances were arranged in the most functional way. The microwave was built into the cabinetry with an adjacent pull-out spice rack and it is closer to the refrigerator making reheating food easier. 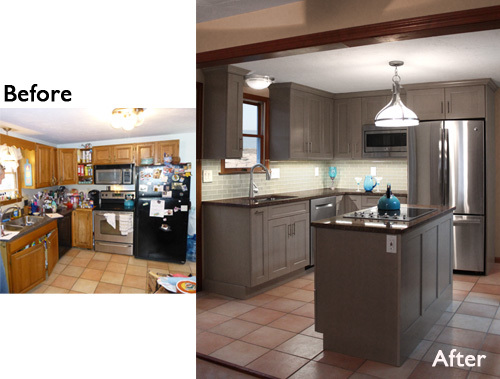 The key part of overhauling this kitchen was upgrading the cabinetry, countertops, and appliances as well as adding a unique backsplash tile. 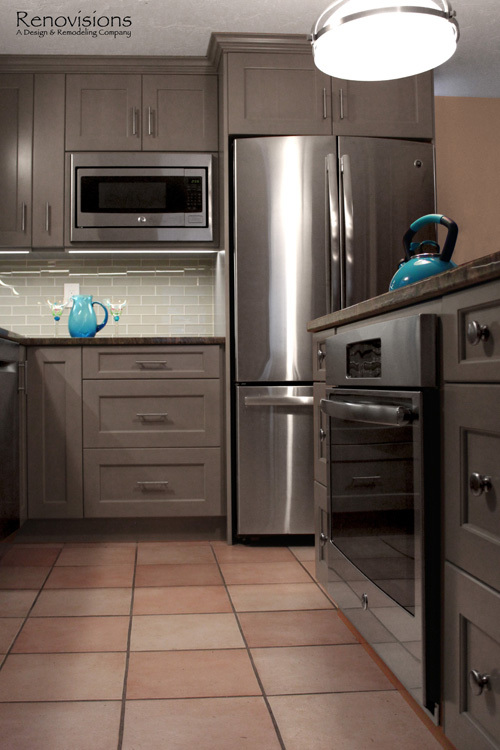 Renovisions suggested the gorgeous maple wood cabinetry with a light grey stain. The stainless steel appliances play off the grey cabinetry, colorful veining in the granite countertops and attractive glass subway tile, giving the kitchen a sleeker and more modern look.